Cinnamon Pass is part of the famous Alpine Loop when combined with Engineer Pass. 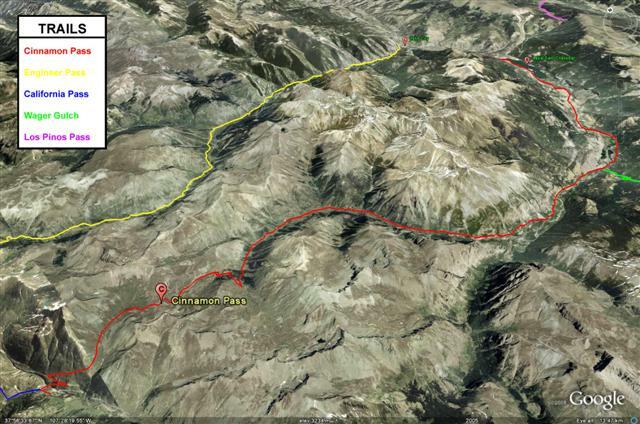 This loop is a ‘must do’ trail for anyone visiting the San Juan Mountains. Cinnamon Pass is the easier of the two trails in the loop and can easily be traversed by any stock 4×4 with decent ground clearance. This trail is a very relaxing drive with spectacular scenery. This pass tops out at an elevation of 12,640 feet and offers a nice view of the switchbacks heading back down into the valley after the pass. When you are done with the Alpine Loop and end back up at Animas Forks, there are a number of other trails that you can follow from there including California Pass and Placer Gulch. Or you can just head back to Silverton and wander around that interesting town. Please feel free to leave your comments and post your pictures from Cinnamon Pass below. This entry was posted on Thursday, March 27th, 2008 at 1:20 pmand is filed under . You can follow any responses to this entry through the RSS 2.0 feed. Both comments and pings are currently closed.